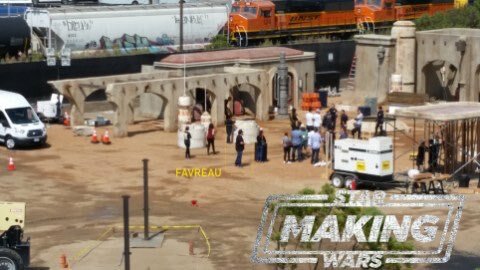 Jon Favreau’s live-action Star Wars TV show begins (or has begun, by the time you read this) shooting in South California soon and these shots of the set indicate that at least some of the action will take place on the desert planet of Tatooine. For those who don’t know, Tatooine’s a key part of the Star Wars mythology being the home of the Skywalkers, who went on to have a large impact on the galaxy. Not to mention its iconic dunes, Jawas, Tusken Raiders and Banthas play a large role in the public image of the franchise. Despite that, the Disney Star Wars movies haven’t ventured there yet (though there are those who convincingly argue that Jakku’s merely Tatooine under a different name). While it’s not conclusively Tatooine, the scenery you’ll see in the gallery down below is extremely reminiscent of what we’ve seen in The Phantom Menace, A New Hope and Return of the Jedi. 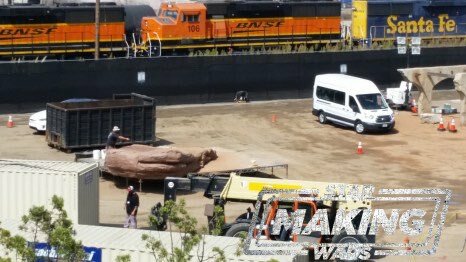 The pictures come to us courtesy of Jason Smith, editor-in-chief of a Star Wars fansite who’s clearly jazzed at the notion them shooting this in his “backyard.” He explains that he’s seen some moisture vaporators, but not quite the same variety as featured in A New Hope, that the set has a “small marketplace kind of vibe to it” and there’s some type of well-like structure involved. Rumor has it that Favreau’s series will focus on the Mandalorians. These are a warrior-like race much mentioned in the Legends continuity (and prominently featured in the Knights of the Old Republic video games). If the show’s about Mandalorians in their prime, it should be set quite a ways in the past, as the only remaining character with Mandalorian ancestry in the Original Trilogy is Boba Fett. Now, Fett’s no stranger to Tatooine, which might give us a hint as to where they’re going with the Mandalorian Connection. 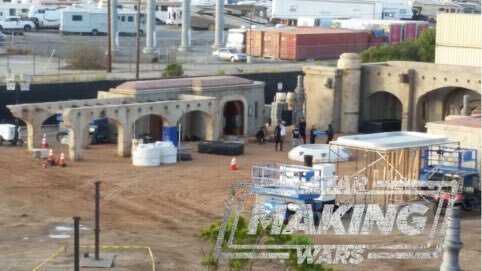 Having said that, there are rumors that the show will be set after Return of the Jedi and depict Mandalor struggling to reassert itself. Whatever it ends up revolving around, Disney and Lucasfilm have high hopes for this project, describing it as their Game of Thrones. And with Favreau at the helm and a reportedly healthy budget, I can’t wait to see what they cook up. No word yet on when it’s due to arrive, but presumably it’ll be here sometime in late 2019. As always, watch this space for more.